All my filter columns are indexed, and the result should only return a maximum of 161 items but I'm still getting the view threshold error message -- do I need to index the columns being displayed as well? I don't have any 'group by' settings as well. The view is for a leave request list displaying only employees that are out today. There are only 161 employees using this system so the view shouldn't return more than 161. This seems to be a problem with ordering of your query condition. 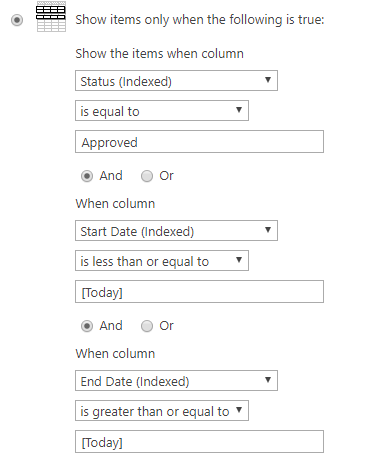 When you filter large list the first indexed column in the query should reduce the data set to less than 5000. SharePoint will then be able to apply other filters and return the results. I would suggest reordering the query such that the first index column reduces the data significantly. Based on the screenshot above you can try to move 'End Date' greater than today to the top as there should only be fewer items. As you know the data better you should be able to make that determination. You can refer to Microsoft support article section 'using filtered views' for reference.